It’s not just Facebook and Google that have loads of our personal data. There’s also Amazon. The company isn’t only the most popular Internet retailer in the country but it also dishes up content (via Amazon Prime Video, Audible and the Kindle library); runs a successful cloud platform for businesses (Amazon Web Services); sells devices like tablets, Kindle e-readers, set-top boxes and streaming sticks; and lets you access a personal assistant via Alexa-powered speakers and screens. It took the Cambridge Analytica scandal – the unauthorized access of Facebook user data from as many as 87 million accounts — to shine a bright spotlight on how much personal data we’re (over)sharing, and what’s being done with it. You may have downloaded your Facebook and Google data. Now, take a look at Amazon. Want to see how much Amazon knows about you? 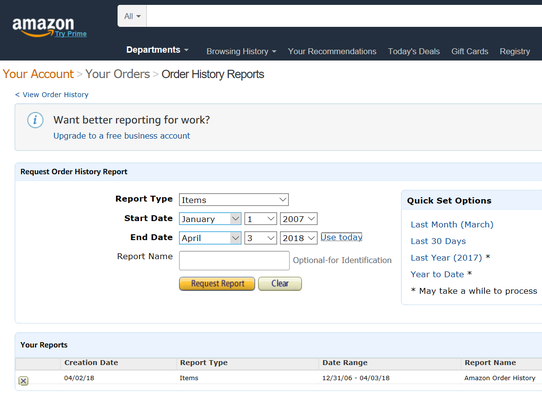 Let’s start off with creating an order history report based on anything you’ve ever bought from Amazon.com. Make sure you’re signed into your Amazon account, and then tap or click here to download shipment, return, and refund activity for all orders. You will be prompted to select the start and end date (I chose to download it all), report type (items, orders and shipments, refunds, or returns), and if you like, give the report a name. 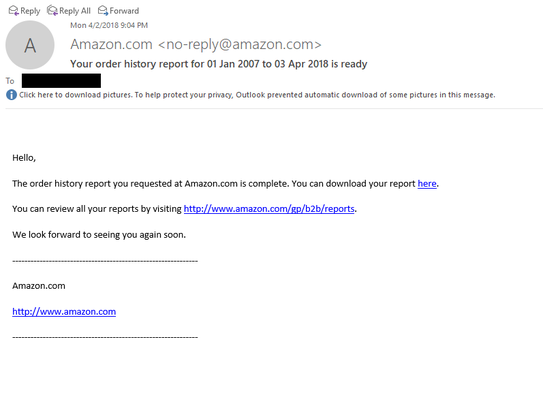 When the report is complete, you’ll be prompted to download it as a .CSV file, which is compatible with Microsoft Excel, plus you’ll receive a second copy in your email inbox (the account registered to your Amazon.com profile). I didn’t find anything too shocking. I asked for more than 11 years’ worth of my purchases, in fact, which looked like a long spreadsheet with all the items I bought listed in chronological order, with dates, prices, the address it shipped to, and more. Good to have for my records. Your profile is a page contains your public name, a collection of your public activity on Amazon, as well as public information you want to share with others. Click here for instructions (and a link) to view and/or change your Amazon profile information. For example, you’ll find a photo of yourself (if you ever uploaded one), any time you’ve publicly reviewed a product at Amazon, or given any hearts or votes to something or someone. You’ll also be able to see and change your private info tied to your profile, such as shopping lists and wish lists, if you’ve ever shared your Prime benefits and digital content with someone in your household (and with whom), and if you’ve ever registered your pet or vehicle with Amazon to find relevant accessories (who knew this was a thing)? At this page you can edit your profile, too. As you likely know, whatever you search for or bought on Amazon.com is noted – and you’ll likely be served up relevant ads at a future time. In other words, if Amazon knows I like gadgets, then it will (understandably) advertise tech toys to me, in the hopes I’ll buy more. If you ever asked Alexa to play a specific song, give you the weather, or tell you how many calories are in a doughnut, you can hear yourself ask this. Amazon says it keeps the voice recordings associated with your account to improve the accuracy of the results provided to you and to improve their services. If you delete these recordings, it may degrade your experience using voice features. Note: the Amazon Alexa app on a mobile device lets you see and hear all your recorded questions or comments over the years, and delete any of them one by one, but the Amazon.com website merely gives you the option to delete all your audio recordings without seeing or hearing them. In other words, the app doesn’t let you delete all your voice recordings in one fell swoop, and the website doesn’t let you see and hear your individual voice recordings. To listen to your dialog history in the Alexa app, go to the menu and select Settings. Scroll to the General section and select History. Select an interaction from the list, and then select the Play icon to listen to the interaction. To delete individual recordings, select Delete voice recordings. This removes the audio files, as well as the Home screen cards related to that interaction. If you only want to remove a Home screen card in the Alexa app, find that card on the Home screen and select Remove card. On a computer, click or tap here to start the process. Go to Manage Your Content and Devices, and select the Your Devices tab. From the list of devices registered to your Amazon account, select your Alexa device. Select Manage voice recordings. Select Delete. Finally, Amazon gives you the option to view and manage your devices and content tied to your Amazon account. Start by clicking here and click on Devices or Content. For me, under Devices, I see a half-dozen devices listed, such as Marc’s Kindle, Marc’s Android Device, Marc’s iPad 2, Marc’s iPhone, Marc’s Echo, and so on. If you tap or click on each device you’ll get more info (such as serial number for that product) and associated email address, plus you can deregister each device, set as default device or view device content (see below). Alternatively, you can choose to view Content individually, such as every book you bought, the author, when you bought it, and so on. With the Actions tab you can choose to delete it, gift it, and more. Well, that’s about it. Easy peasy. There are two things Amazon can improve on. One is to put all of these privacy controls in one place instead of multiple screens (and needing an article like this to know how to navigate it all). 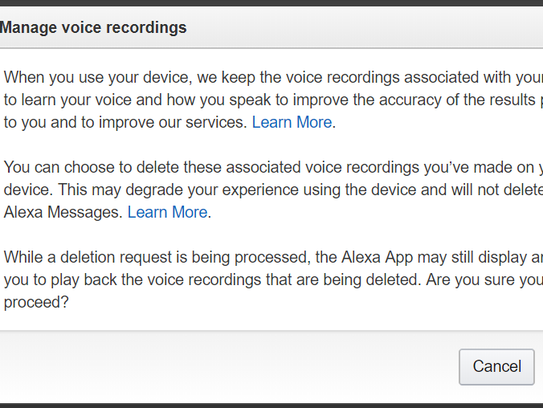 Secondly, as previously mentioned, Amazon does not let you view or hear all your Alexa audio recordings on a computer for some reason – only on the mobile app tied to your device – and so that should be the same experience on both kinds of devices. Overall, however, seeing, managing, downloading or deleting all your Amazon content was a breeze. This story is by Marc Saltzman and originally ran in USA Today. It’s reposted here with Marc’s permission.